Baileigh model DP-1500VS heavy duty drill press comes standard with power feed and a quality auto reversing tap feature. This is a quality made machine using only the best quality castings and base metals to support rigidity when drilling at maximum capacity with the power down feed. The base and drill table is made from a heavy casting that has oversized T-Slots for secure clamping of a vise or fixture. 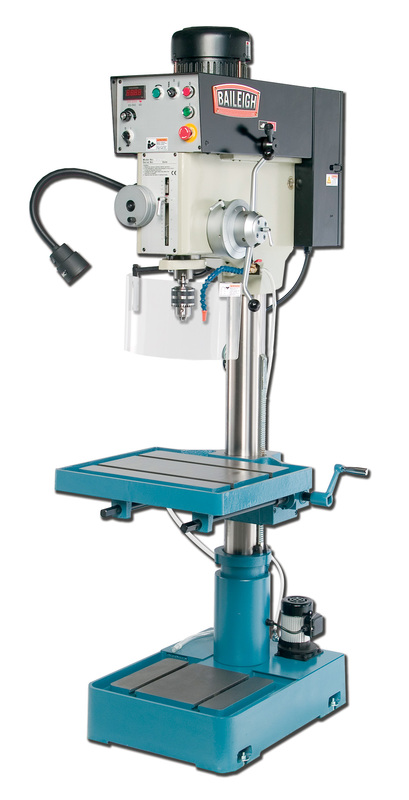 This variable speed drill press has an inverter driven head whose quill speed can be properly adjusted to each different drill size that really will extend tooling life. Adjustments to the speed can be done by a speed potentiometer dial, noting the RPM is displayed on the digital read out. Additional standard features of this quality floor type drill press are a safety guard with limit switch, a powerful coolant system, and a bright halogen light. Drill Capacity Cast Iron 1.5"
Spindle Nose to Table 22.75"
Spindle Nose to Base 40.75"
Table Dimensions (L/W) 22" / 18.5"
Base Dimensions (L/W) 27" / 19"
Shipping Dimensions (L/W/H) 40" / 25" / 83"